At one point or another every shelter owner wishes that every day could be filled with pleasant weather and sunshine. We all know that can't be the case every time you spend the day outdoors. For times when Mother Nature has her own ideas about how your day should go, you can take matters into your own hands using this Caravan Canopy Rain Gutter. You can this rain gutter setup to connect two Caravan 10 x 10 canopies. You're not connecting the frames, mind you, you just attach this gutter quickly and simply between the two canopy tops (situated next to each other, of course) to create a completely covered area that comprises both canopies and the gutter-protected area. The polyester fabric gutter diverts rainwater in the area between the canopies, so you essentially end up with a 10 x 20 foot covered area with a handy gutter system in the middle. If you spend enough time outdoors, you're going to run into some inclement weather at one point or another. It doesn't have to be a disaster, though, and it doesn't necessarily need to even be that inconvenient. Being as unpredictable as it is, the weather may dictate from time to time that you use a Caravan Canopy Rain Gutter system to keep your friends or family dry and having fun when bad weather threatens. WARNING: This product can expose you to chemicals including Diethylhexyl Phthalate, which is known to the State of California to cause cancer, birth defects, or other reproductive harm. For more information go to www.P65Warnings.ca.gov. Will this rain gutter fit an EZ-UP Canopy and how would I attach the side tarp with the rain gutter in place? We cannot advise how this Caravan gutter will work on an EZ-UP. For a Caravan, the gutter slides between the valance and the wall. We used this item to keep the rain off of our concession table. What a great idea !!! 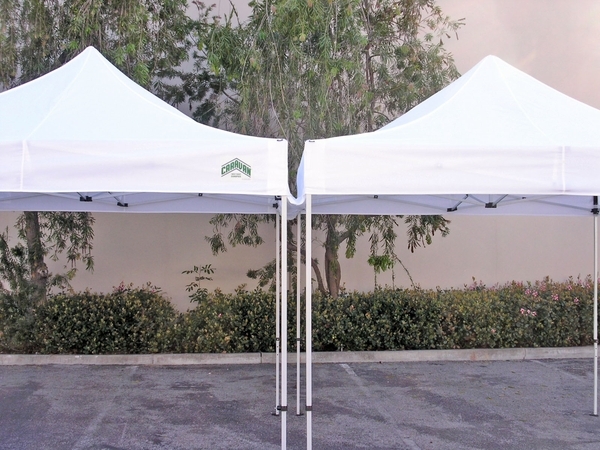 ProsKeeps you dry when it rains and you are using both canopies...Allow us to have a continuous protection for us and our concessions. ConsI can't think of 1 negative comment.